Home Android Myphone Phones & Tablets MyPhone Storm Specs,Price and Availability in the Philippines! 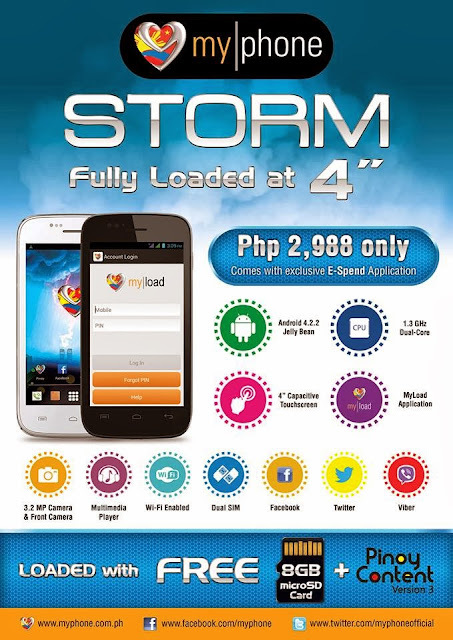 MyPhone Storm Specs,Price and Availability in the Philippines! Recently, philippine local brand MyPhone released the Myphone Agua Iceberg Mini, a 5”Full HD Corning Gorilla Glass 2, powered by 1.5GHz Quad-Core MT6589T Chipset, 2Gb of RAM and 16Gb of internal memory. As the christmas season arrive, another smartphones revealed by this mobile brand. For only Php2,988, the new MyPhone Agua Storm can be had, a 1.3GHz Dual-core processor, running with android jellybean. Looks like many of us disappoint right now on the low internal memory that surely can't accommodate more downloadable apps, but the good thing is, MyPhone has a ready answer for that. They will give a FREE 8Gb microSD card for the first few buyers. Download Adobe Photoshop CS2 for FREE! Globe iPhone 5s for only Php1,799/ month! Cherry Mobile Flare HD Revealed! Ipad Air and Ipad Mini is coming to Smart!